Khirbet Rosh Zayit - The Biblical Cabul? Ruins of an Iron age site, in the hills above the plain of Cabul. An 11th-8th C BC Phoenician fortress, regional administrative center, military post and agriculture village. 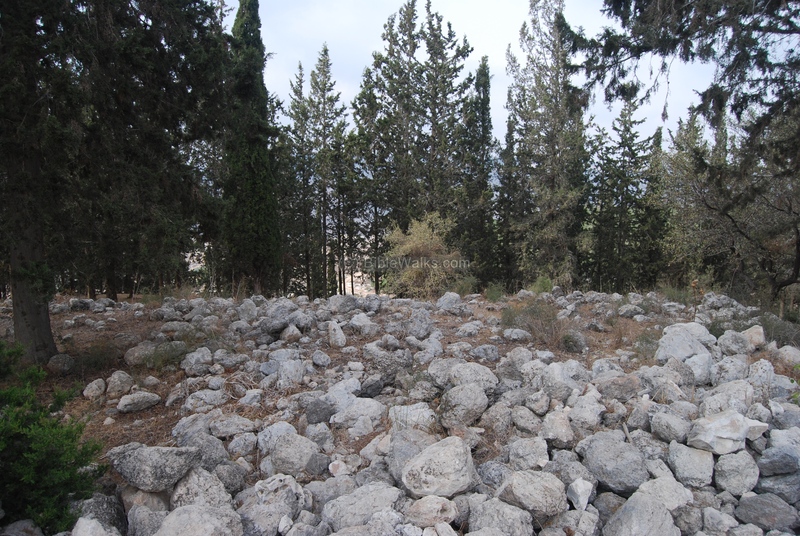 The site may be identified with the Biblical Cabul from the times of King Solomon. 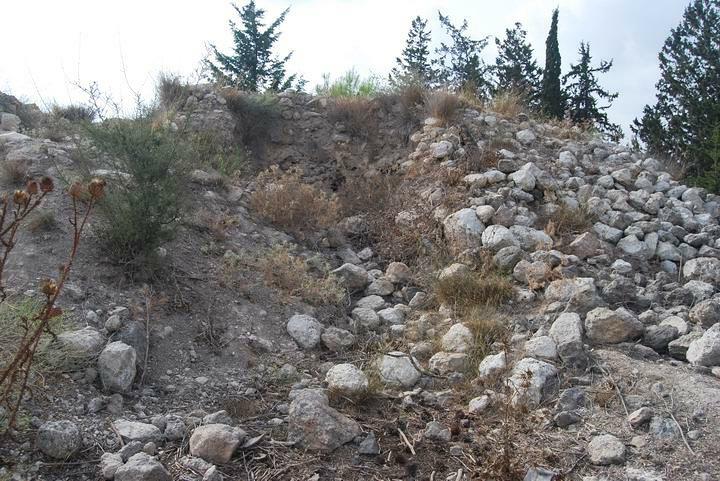 1 Kings 9:11,13: "King Solomon gave Hiram twenty cities in the land of Galilee...And they were called the land of Cabul, unto this day"
Ruins of an Iron age site, in the hills above the plain of Cabul. Excavations reconstructed an Israelite structure from the times of King Solomon, several oil presses, an impressive Phoenician citadel, and an agriculture site that lasted until the 8th C BC. The findings indicate that the site was a central Phoenician administration center for the region, and may be identified with the Biblical Cabul from the times of King Solomon. 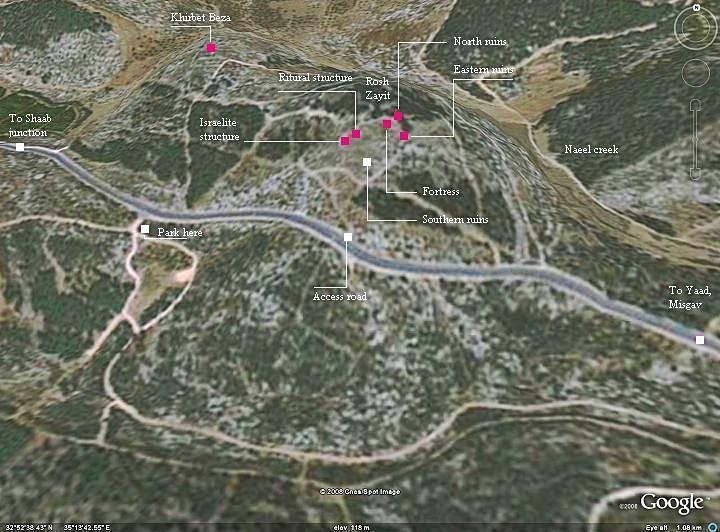 The site is located on the road (#805) that climbs up to Misgav, 1 KM before the junction of Yaad. It is situated on a hill (height 152M) on the north side of the road. You can point on the purple points to navigate to the selected site. The ancient city was part of tribe of Asher (Joshua 19: 24-27): "And the fifth lot came out for the tribe of the children of Asher according to their families. And their border was ... And it turned toward the sunrising to Beth-dagon, and reached to Zebulun and to the valley of Iphtahel northward at Beth-emek and Neiel; and it went out to Cabul on the left hand". King Solomon imported wood in order to build the first temple in Jerusalem (2 Chronicles 2 1,8,16): "And Solomon determined to build an house for the name of the LORD, and an house for his kingdom... And Solomon sent to Hiram the king of Tyre, saying,... Send me also cedar trees, fir trees, and algum trees, out of Lebanon... And we will cut wood out of Lebanon, as much as thou shalt need: and we will bring it to thee in floats by sea to Joppa; and thou shalt carry it up to Jerusalem". The implied reason was that King Solomon had to pay for his debts (to pay the cost of the timber, labor and other goods), and he paid with prime real estate (although Hiram was not pleased as per the Biblical text). Actually, this old treaty lasted for 3000 years until Israel was founded, since the area of west Galilee always remained under the Phoenician control. Where is Cabul? The Biblical site is not positively identified, and according to some scholars and recent excavations it may be located in Khirbet Rosh-Zayit. The site was partially excavated and several of its structures were beautifully reconstructed, including an impressive Phoenician citadel from the times of the Israeli Kings (11th C BC), with storage rooms and vessels. Additional residential buildings were also dated to the 11th C. These findings indicate that the site was a central administration and military post for the Cabul region. 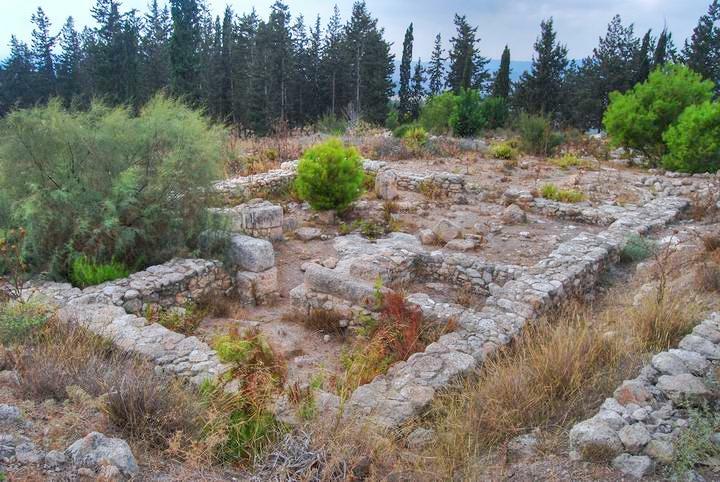 This is an important finding, which backs up the Biblical description of one of the oldest agreements between two nations - Phoenicia and Israel - from more than 3000 years ago. 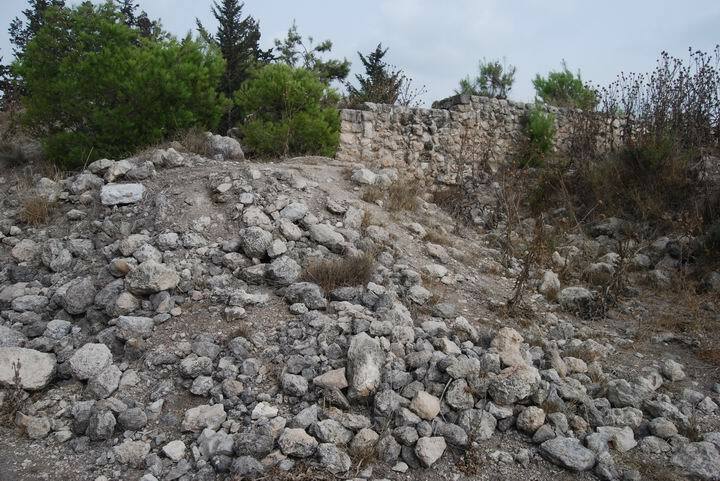 The fortress was destroyed around the beginning of the 9th C BC, and then it was inhabited by a small agriculture village, which relied on the olive oil production as a source of income. 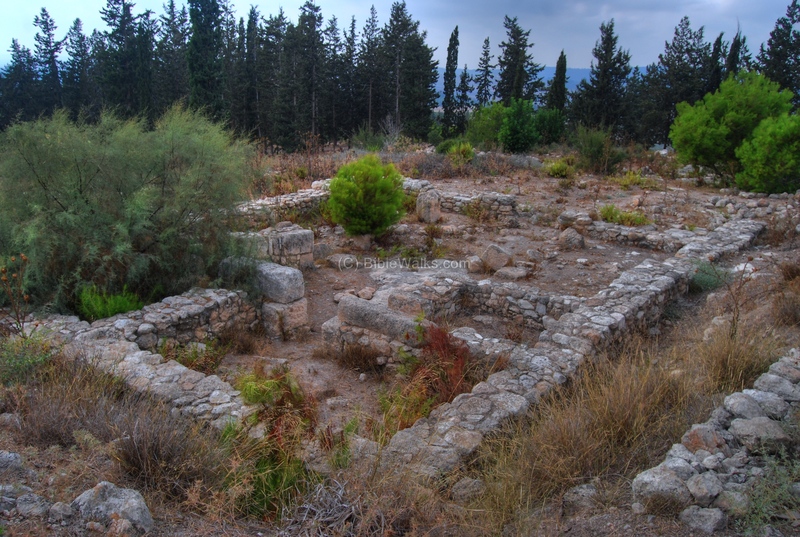 Several oil presses were excavated and indicate that the name of the site (Hebrew for: Head of the Olive tree) was based on the abundance of olive trees and oil production. 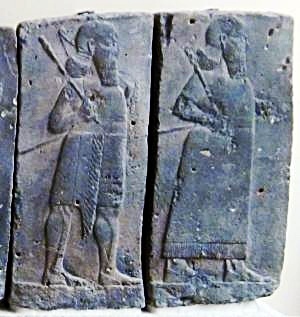 This village was destroyed in the 8th C (734-732BC), after the intrusion Tiglath-Pileser III (Kings II 15: 29): "In the days of Pekah king of Israel came Tiglath-pileser king of Assyria, and took Ijon, and Abel-beth-maacah, and Janoah, and Kedesh, and Hazor, and Gilead, and Galilee, all the land of Naphtali; and he carried them captive to Assyria.". This intrusion wiped out most of the Galilean sites, as written in the Bible, and it was never inhabited again. 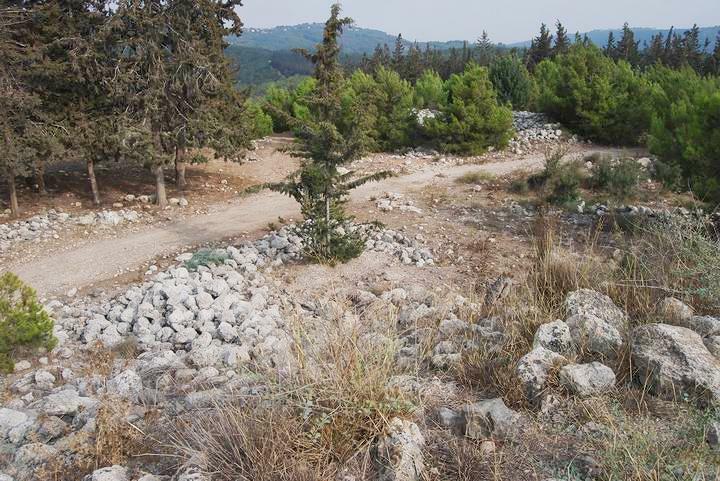 It was relocated during the Hellenistic period to another site closer to modern village of Kavul. 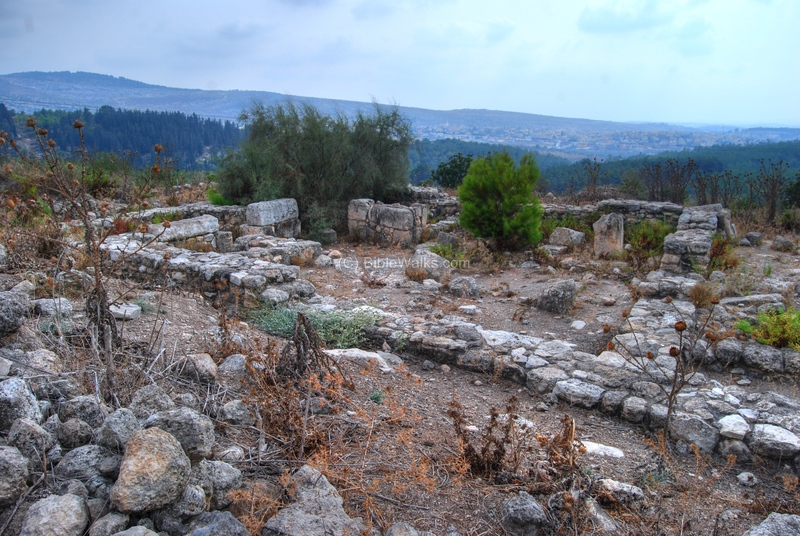 A Roman village was established 800 years later on the north-west side of the hill, 500M from Rosh-Zayit. The site is in ruins, and is called Khirbet Beza (in Arabic: Baz'awiya, Baz'ua). After initial excavations, the site was dated to the 1st and 2nd C AD. The first season, managed by Motti Aviam, unearthed an oil press and a private house. The site is well preserved, but requires more digging. One day it could be coupled with Rosh-Zayit to become an archaeological park, as planned by the regional council of Misgav. 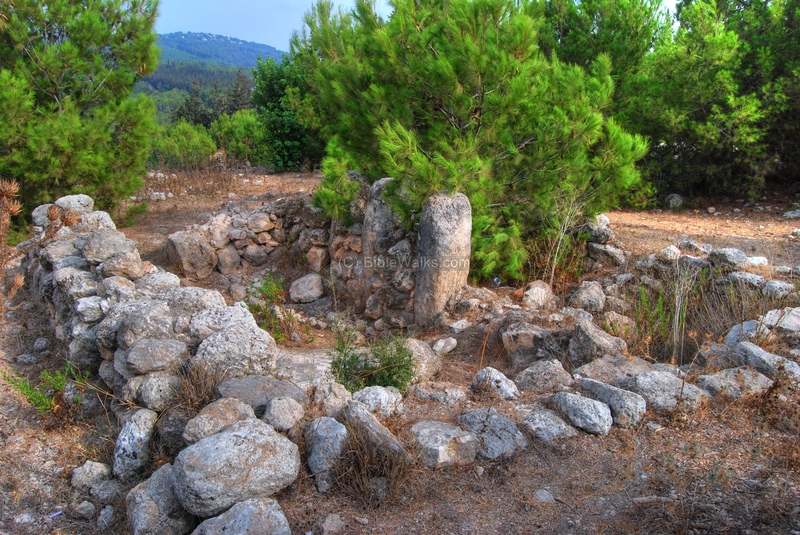 The site has been excavated and partially restored by Zvi Gal after several seasons (1983-1992). 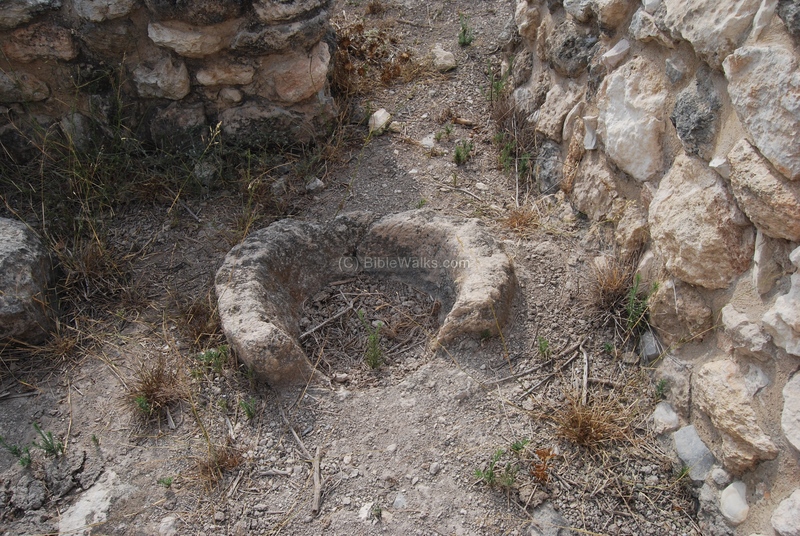 It is open to the public and can be accessed by walking up the hill from the main road to Segev. This photo is an aerial view which was captured by a drone from the west side. The site is located on a hill, and is quite large for an Iron Age site. Only the ruins on its summit were excavated so far, and seen in the center. Road #805, here on the right, loops around its southern foothills. Another view, from the opposite (eastern) side of Kh. Rosh Zayit, is in the next photo. The modern Arab village of Kabul is seen on the upper left side of the view. In the site are traces of ruins of dozens of structures. One of the houses, dated to the 8th C BC, was reconstructed on its western side, as seen below. It included four open spaces - three parallel and the forth perpendicular, which is typical of the Israelite structures at the time of the Kings. In its central yard was a storage place for olive oil. Around the structure were several oil press installations, each included a crushing basin, weights and collecting place for the extracted oil. Another view of the reconstructed house is seen below. 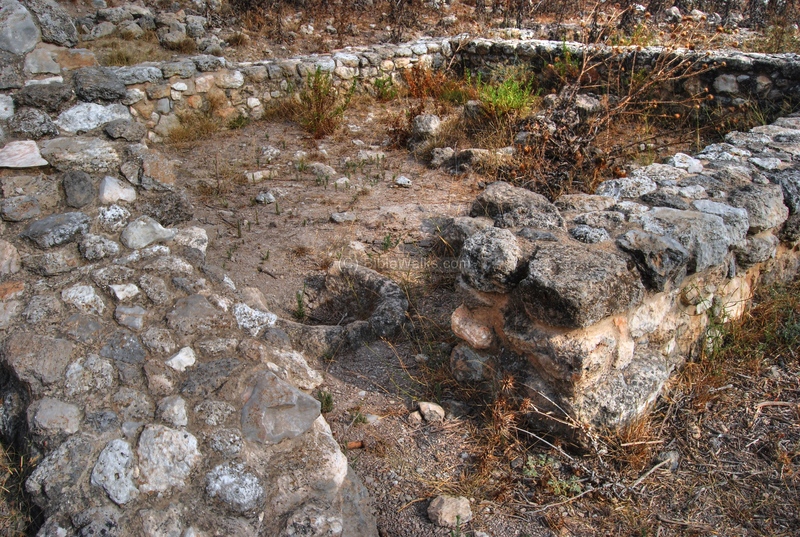 Nearby, another reconstructed house was identified as a ritual structure. A closer detail in the entrance to the structure is seen below. Among the findings was a small censer and two fragmentary figurines. The photo below shows the road that cuts through the site. On the left side is a small forest with traces of ruins of structures. 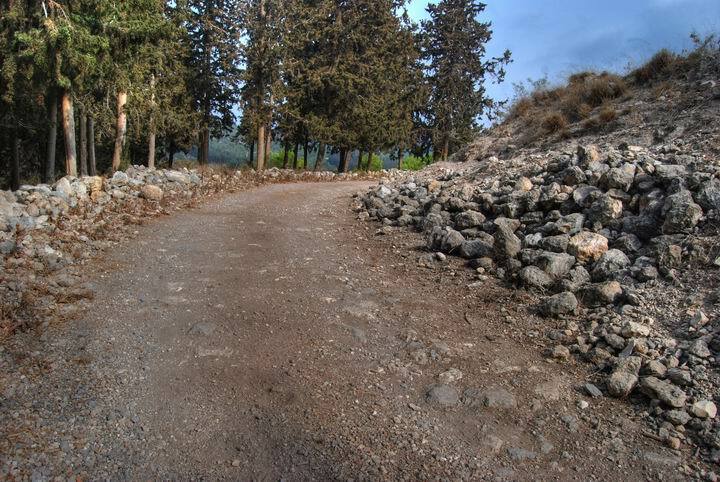 On the right is a steep hill leading to the Phoenician fortress. The stones on this eastern side are part of its fallen walls, which surrounded and protected it. 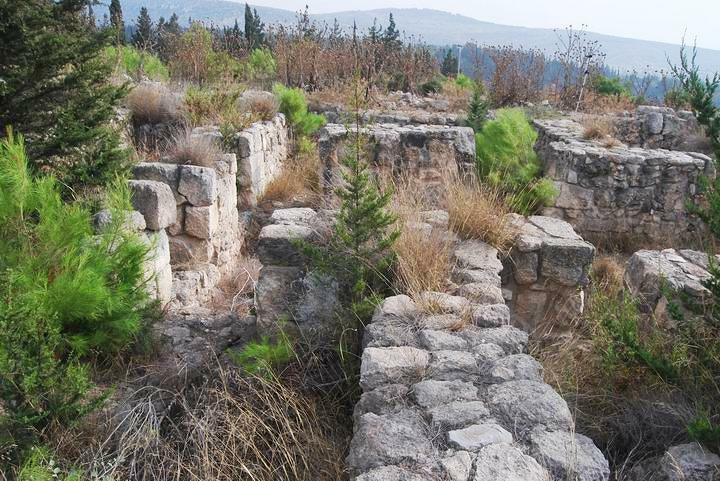 The fortress was probably a regional administration center, perhaps for the twenty cities that the Bible told that were given to Hiram as part of the land of Cabul. Hiram came to inspect the land that King Solomon gave him, and was disappointed... perhaps he stood up there? Some of the walls have been reconstructed during the excavations, as this section on the north-west side. In the center of the fortress is a two story structure. The rooms on the lower floor contained storage rooms, where jars stored food and water. The excavations unearthed many Phoenician ceramics and iron tools. 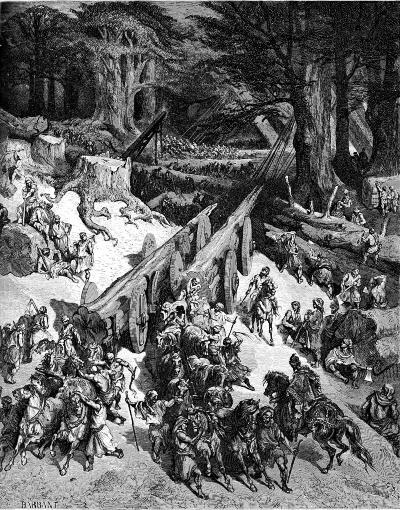 They dated the destruction of the fortress to the beginning of the 9th C BC. On the top side of the fortress is a section of the wall which is paved with stones, which looks like part of a defense glacis. The photo below shows a view from the top of the fortress to the north-east side. The modern settlement of Yaad is seen in the background. Nearby is a large layer of fragments of ceramics, left over from the excavations. 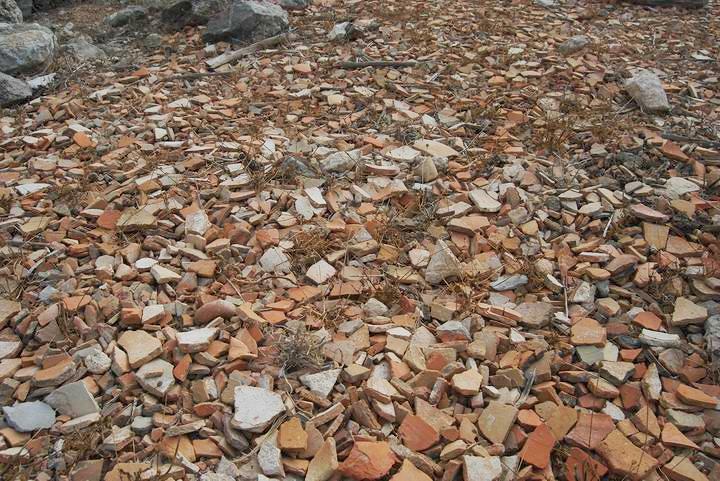 A large number of Phoenician jars, storage vessels and pottery were found in the excavated structures. The team left behind these fragments that could not be assembled together, or were missing the rims which are commonly used for dating the ceramics. In the north side of the site are traces of more ruins which have not yet been excavated. The excavations covered so far only few of the central structures, and the rest of the 80% of the site is still waiting for future archaeological works. These structures belonged to the agriculture village that existed after the destruction of the fortress, from the beginning of the 9th C until the end of the 8th C BC. An aerial view of the eastern side is seen in the following photo. The next photos is a ground view of the eastern side, with scattered ruins. 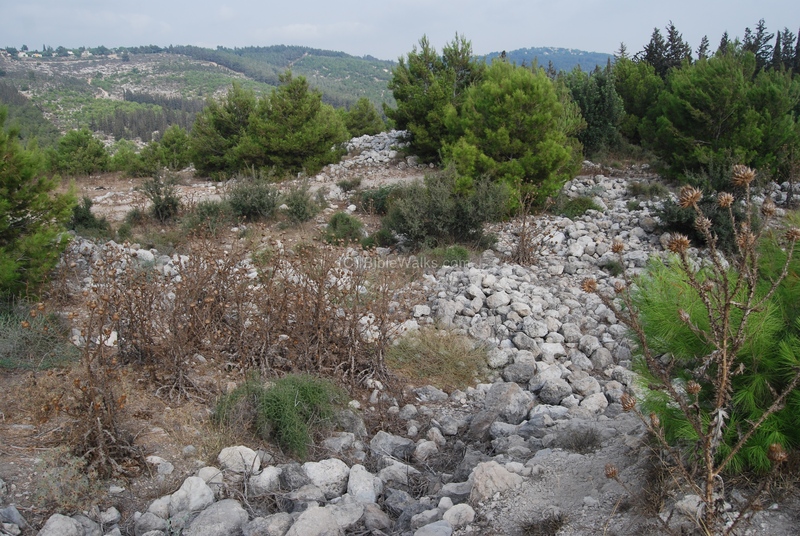 The settlement of Yaad is on the left background, while Segev/Atzmon on the right background. An oil press is located in one of the reconstructed houses. Kavul - In Hebrew, a muddy soil which is found in swamps, and is a deposit of decaying plants in swamps. Zayit - In Hebrew: Olive. Rosh - In Hebrew: "Head of", or "Tower". Rosh Zayit - Hebrew: Head of the Olive tree, based on the translation of its Arabic name of Ras E-Ziton. This name is probably based on the large number of Olive trees in the area around the hill, and the oil presses in the site. Is this the location Biblical Cabul? This site has an Iron age level and Phoenician structures, so it is very likely that indeed it is the Biblical Cabul The modern village of Kabul, which is located south to the site, preserved the ancient name of Kevul, and therefore there is a high probability that the Biblical site is its vicinity. Khirbet Ya-anin (Ne'iel)- 1 KM north-west to Rosh-Zayit; 1KM west to Sha'ab. This site can also be identified as Biblical Ne'iel, another city in the land of Cabul. 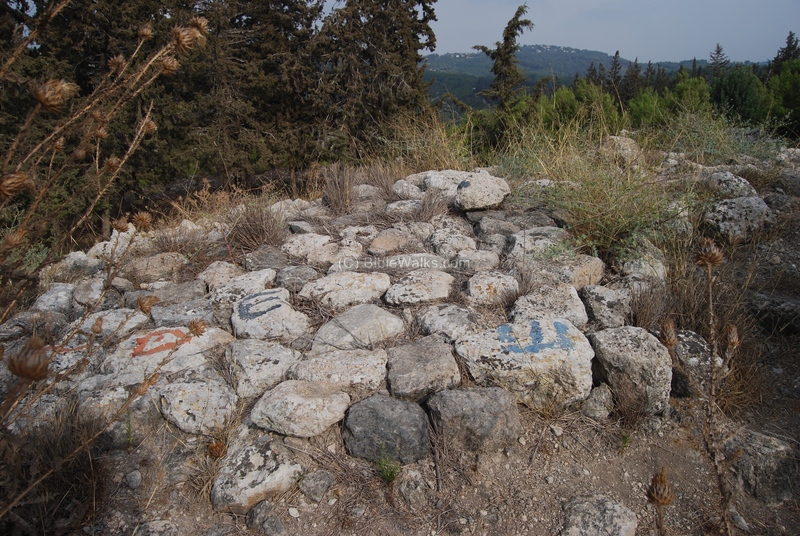 Lower Galilee in 8th to 6th C BC Israel Antiquities (article in Hebrew); includes a history of lower Galilee and recent surveys of the area, with references to Rosh-Zayit.